Channon was born and raised in the Chicago area. He received a Bachelor of Arts degree in Fine Arts from Grinnell College, and a Masters in Architecture from the University of Illinois at Chicago. 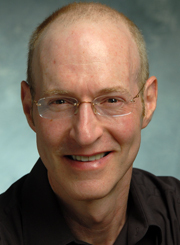 He met his partner, Bruce Koff ( coincidentally a Grinnell College alum ) , at Or Chadash, the LGBT Jewish congregation, in 1982. Mitchell’s parents, Mayer and Vivian Channon, were leaders in the local chapter of Parents and Friends of Lesbians and Gays ( PFLAG ) throughout the 1980s. Mitchell is a successful interior designer who founded his own interior design practice, Mitchell Channon Design, in 1991.